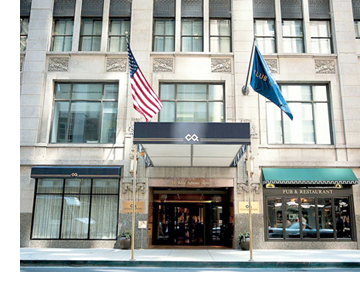 Inter/Micro has secured a block of rooms at special rates with the Club Quarters, Central Loop hotel, 111 W. Adams Street. These rates will be available until the room block has been fully reserved by attendees. To reserve a Club or Standard room at McCrone’s low member rates, please call +1 312-214-6400 or +1 203-905-2100 or reserve your room online. Note: you MUST make reservations this way to receive a daily $20 transportation credit/reimbursement from the Club Quarters (see Member Services Desk at the hotel for reimbursement). The Club Quarters hotels are not within close walking distance to McCrone Research Institute, but taxi service, online transportation (Uber, Lyft, etc. ), and public transportation is readily available. Reservations made directly with Club Quarters hotels in Chicago include a $20 daily transportation voucher/reimbursement from the hotel. This hotel is not within close walking distance (approximately 3 miles) to McCrone Research Institute, but taxi service, online transportation (Uber and Lyft), and public transportation (CTA buses) are available.